This Post Office building was built in 1914, and is located just north of the square in Wooster. Located at 144 North Market Street in Wooster, this six Doric-columned classical structure was built in 1914 by The United States Postal Service as a new post office, with a later addition built to the rear to house a mail-sorting facility. Listed on National Register of Historic Places, the building boasts marble walls, high ceilings, and seals of the pony express and the U.S. Treasury. On this same site in 1839, Samuel Foss ran an establishment called the Wooster Brush and Fancy Bellows manufactory. In later years, a doctor’s residence and office was located here, which was moved to a new location around 1911. This building served as the Wooster Post Office until a modern post office building was constructed on South Street, and dedicated May 21, 1967. 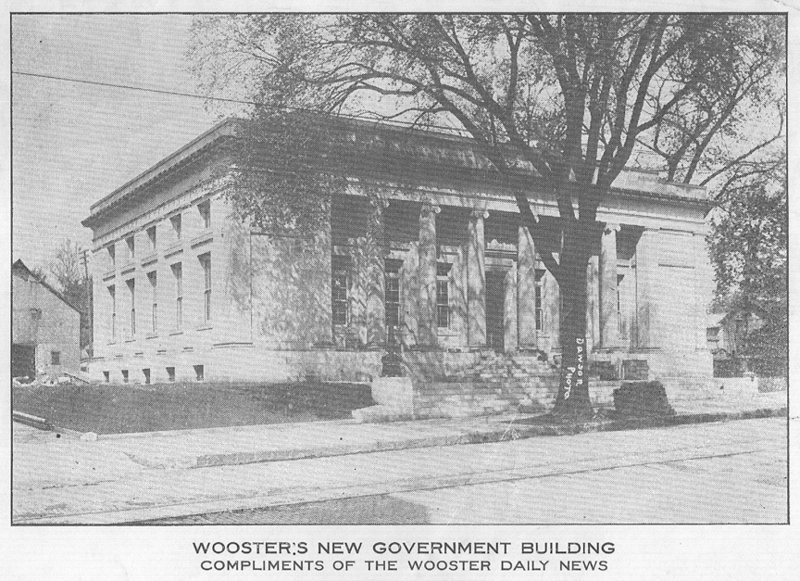 In 1974, the Postal Service sold the building to Wooster City Board of Education. At that time, the interior was redesigned to contain the district’s administrative offices, with inexpensive paneling and drop ceilings installed in the interior. Several grants were received for renovating the old structure, and in 2003, this historic building underwent a $1.5 million renovation. LuK Inc. donated $250,000 to restore the original post office lobby to its original elegance, and a $500,000 grant was received from the U.S. Department of the Interior, National Park Service Historic Preservation Fund. We commend everyone involved who has preserved the past, while putting this beautiful, useful structure to use for future generations. Every effort is made to provide information that is accurate. Some information has been provided by third parties, and the WCHS is not responsible for the accuracy of such information.